Click here for a sample of ANC032. Key milestones dot the evolutionary journey we all begin as infants: the social smile, name recognition, mastery of hand-eye coordination, bipedal ambulation. In these early stages of life, an additional pathway branches off as children build an awareness of literary conventions and begin experimenting with the quintessentially human act of leaving marks upon a surface. Explorations of space and form give way to random strings of letters, the concept of words takes root, and finally an appreciation of phonics and punctuation leads to the basic communication. Throughout, a fascination with the act of writing and the pleasure we take in its mystifying elegance lead us ever forward in our development. Curt Kupferschmid's minimalist poetry engages in a similar sense of play, both for its creator and audience. 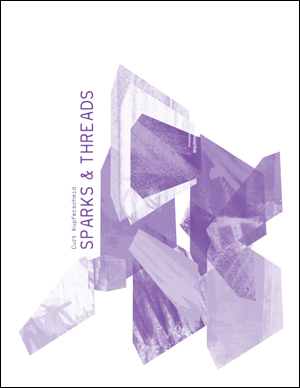 In Sparks & Threads, his first collection, words, fragments, and letters dance across the page. Rather than crafting a metaphor to be digested, these bits of language make no claims and draw no conclusions─they merely exist. Concentrating communication down to its inherent beauty, the act of interpretation is left open. The reader is able to find her own meaning, and create her own theme; the poem is truly hers. ANC032 is out of print.